Picture sourced from the United Nations Office on Drugs & Crime. Family trusts are set to come under greater scrutiny from banks when the Anti-Money Laundering and Countering Financing of Terrorism Act becomes law on June 30 next year, the New Zealand Bankers' Association (NZBA) says. NZBA CEO Kirk Hope told interest.co.nz that banks would be stepping up customer due diligence under the anti-money laundering laws. Hope said the Act will require banks to collect specific, and more comprehensive, information from customers to verify their identity and address. "That affects customers who are acting on behalf of other customers," Hope said, citing the example of someone acting as a trustee on behalf of someone else. "Basically all banks who bank family trusts and things like that, part of the due diligence programme will mean literally having to go through those trust deeds and ensure that the trustees are identified appropriately. This is the scale of what we're talking about (under the Act), so it's quite significant." Passed by Parliament in October 2009, the Act's aims are to detect and deter money laundering and the financing of terrorism, maintain and enhance New Zealand’s international reputation by adopting, where appropriate in the New Zealand context, recommendations issued by the Financial Action Task Force, an inter-governmental body established by the Group of Seven (G7), and to contribute to public confidence in the financial system. A paper prepared for Commerce Minister Craig Foss by the Ministry of Business, Innovation & Employment earlier this year entitled Overview of organised crime and the misuse of corporate structures put a NZ$1.5 billion estimate on annual money laundering in New Zealand, excluding laundered funds relating to tax evasion. A Reserve Bank sector risk assessment report suggests banks are a "high" money laundering risk, finance companies and building societies are medium risk, credit unions low risk and life insurers medium/low risk. It says the high rating for banks is consistent with the characteristics of the banking sector in the absence of anti-money laundering and countering financing of terrorism requirements. The Reserve Bank says banks are high risk because of the large number and value of transactions they do, meaning they can be used at "all stages" of money laundering. Overseas banks and money laundering, or the process by which criminals make money obtained from their criminal activities look legitimate, have been linked most recently by a US$1.9 billion fine handed out to HSBC by US authorities. Meanwhile, Hope said banks will also be running a transaction monitoring processes identifying unusual transactions. And when someone opens a new bank account, that's when the new law is expected to have most impact. "The other instance is when they're acting on behalf of someone else or if a customer wants to give signing authority (to someone else), or where a customer deposits cash over the threshold into another customer's account, or when a non-customer deposits cash over the threshold into a customers account," Hope added. The threshold for domestic currency cash deposits is NZ$10,000 and over, and the threshold for foreign exchange transactions is NZ$1,000 and over. Implementation of the Act comes as the government strives to improve New Zealand's waning international reputation for anti-money laundering and counter-terrorism financing after it was kicked off a European Union (EU) "White List" providing guidance for EU banks and financial institutions about countries with EU equivalent money laundering and anti-terrorist financing laws in June 2011. New Zealand was on the list from its 2008 inception. Although the list doesn't have legal status, customers and financial institutions from non-EU countries on it are viewed as being subject to EU equivalent anti-money laundering and counter-terrorism financing standards. New Zealand's reputation has also taken a hit from a long list of New Zealand registered companies, often so-called offshore finance companies, committing crimes overseas. In but one example two men associated with a raft of offshore New Zealand finance companies, and an online banking platform apparently based in New Zealand but run from Panama, were arrested by Panama’s Special Prosecutor’s Office against Organised Crime for allegedly laundering more than US$100 million as part of an international criminal group. The Ministry of Business, Innovation & Employment paper notes that under the Act trust and company service providers will be regulated from mid-2013 and will have to conduct due diligence on clients including "shell companies" by verifying the identity of the individuals who ultimately control their customers, and establishing the source of their clients' funds if they open a bank account for them in New Zealand and operate that bank account on their client's behalf. Under the Act the Reserve Bank has the power to: On notice, require production of, or access to, all records, documents, or information relevant to its supervision and monitoring of entities for compliance with the Act; conduct on-site inspections, and use methods of supervision not involving the formal exercise of statutory powers such as reviewing annual reports; issuing questionnaires and/or conducting surveys, desk-based reviews of risk assessments, policies, procedures or audit reports, meetings with firm's staff and/or presentations, and analysis of data from external sources. New Zealand banks are joining financial institutions around the globe in tightening up on anti-money laundering. From 30 June 2013 all banks in New Zealand will need to do more to check customer identity and, in some cases, account activity. This is required under New Zealand law. It helps to support our financial reputation overseas, protect us from financial crime, and meet our international obligations to fight money laundering. 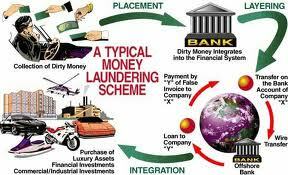 Money laundering describes the process by which criminals make money obtained from their criminal activities (“dirty”) look legitimate (“clean”). It covers a range of methods and levels of sophistication. What will the new anti-money laundering regime do and why is it needed? The Anti-Money Laundering and Countering Financing of Terrorism Act was passed in 2009. The new anti-money laundering regime comes fully into effect on 30 June 2013. The Act is intended to help detect and deter money laundering and terrorist financing. It will contribute to public confidence in the New Zealand financial system, and bring New Zealand into line with international standards. The new regime applies to all New Zealand banks, and other financial institutions, and builds on existing customer identification processes. How it will affect customers? The Act means all banks will need to collect specific information from customers to verify their identity and address. The same goes for those acting on behalf of customers. More information may be required from customers than at present. For example, businesses may need to provide specific information about their owners. From time to time banks will need to ask existing customers if that information is still up to date. Banks may need to ask customers for additional information if their account activity changes over time. They may also need to ask about how customers intend to use their products and services. Collecting and verifying this customer information may take a little more time than it has in the past. All banks and financial institutions operating in New Zealand will apply the same set of rules to customer accounts, but customers might experience slight process differences between each bank. When will it affect customers? The new anti-money laundering regime comes fully into effect on 30 June 2013, but some New Zealand banks and financial institutions may decide to alter their processes prior to this date. Customers will primarily be affected when they open bank accounts, but there may be other instances. · When a non-customer deposits cash over the threshold into an existing customer’s account. Note: The threshold for domestic currency cash deposits is NZ$10,000 and over. The threshold for foreign exchange transactions is the equivalent of NZ$1,000 and over. What if customers are concerned by these changes? All banks and financial institutions operating in New Zealand will apply the same set of rules to customer accounts in line with the Anti-Money Laundering and Countering Financing of Terrorism Act. Any customer concerns about these changes these should be addressed to their bank in the first instance. The Banking Ombudsman can further investigate, if necessary. Banks will be informing their customers of the changes, and will be able to provide more detailed information about how it affects their customers. Section 26 of the act is amusing. What, pray tell, is a "Politically Exposed Person"? (1) The reporting entity must, as soon as practicable after establishing a business relationship or conducting an occasional transaction, take reasonable steps to determine whether the customer or any beneficial owner is a politically exposed person. (b) the reporting entity must obtain information about the source of wealth or funds of the customer or beneficial owner and take reasonable steps to verify the source of that wealth or those funds. (3) If a reporting entity determines that a customer or beneficial owner with whom it has conducted an occasional transaction is a politically exposed person, then the reporting entity must, as soon as practicable after conducting that transaction, take reasonable steps to obtain information about the source of wealth or funds of the customer or beneficial owner and verify the source of that wealth or those funds. Does this mean every unionist, protestor, journalist, local body pollie in the country and overseas? Because it is very easy to read the act that way. And what are these reasonable steps, presumably beyond the enhansed due diligence procedures? Shall the bank be required to know exactly brought lunch for John Banks? Great question Bruce. I assume it's looking at political graft and corruption, but, without reading the legislation, the definition of politically exposed person most certainly would be interesting. It all seems so sensible and easy, but judging by my experience in the UK the exercise is largely futile and exasperating. Yes there are still some money launderers in the UK!! A story going the rounds in my home town in Northern Ireland recounts how a recently retired bank manager went to his former branch to do some business. The lady behind the counter, who the retired manager had trained, said "I am sorry sir we cannot do that as you don't have the necessary ID." There are rumours that the former manager was subsequently admitted to hospital for blood pressure-related problems, but patient confidentiality issues precluded confirmation.